Welcome back, sorry that I have missed a few, but we are back to reviewing comics every day! 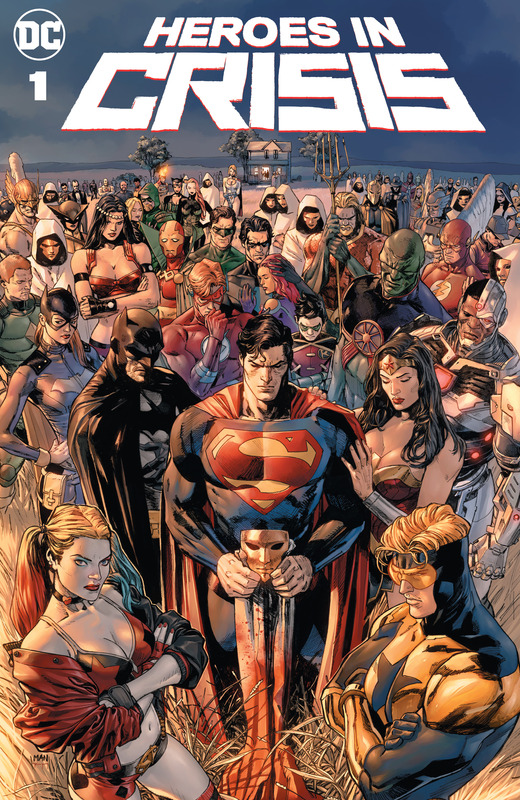 Today, Seppin is going to be reviewing Heroes in Crisis #1 written by Tom King and art by Clay Mann. We have been waiting so long for this! Ever since Heroes in Crisis was announced I have been wondering who was going to die and what Sanctuary actually was recently introduced as a psychiatric ward for superheroes and villains to get some help or to help them with the stress. It’s not cruel like Arkham, at least we think so because we still haven’t really seen it until now. The comic has a very eerie vibe as Superman seems to be flying somewhere quickly. We also get interviews from Hotspot, Harley Quinn, Roy Harper, Wally West, and Booster Gold. All of whom have been admitted into Sanctuary. I love how this comic moves almost like a horror story, but the entire book is filled with bright and happy colors. The art is wonderful and the mystery of who done it is incredible. I won’t spoil anything for this story, but as most crisis start, people die. I also love the repetition that Tom King uses of, “Sanctuary has fallen”. It is sad and reminds me of Olympus has fallen. Considering that Tom King was int he CIA, I think that this effect was intentional. Overall, it is an incredible story that everyone should be reading right now!